Nothing in the Trump budget came as a surprise to me. Nevertheless, I often surprise myself with how often I can still feel outraged over the priorities of people in power. I probably don’t need to tell you what a disaster the Trump budget is for those targeted by the US government’s law enforcement and military. (If you want to learn more, a couple of sources addressing this subject are National Priorities Project and TomDispatch.) But in short, the proposed 2018 federal budget reduces non-military discretionary expenses (such as health, housing, education, and more) by $54 billion to pay for $54 billion more for military expenses. 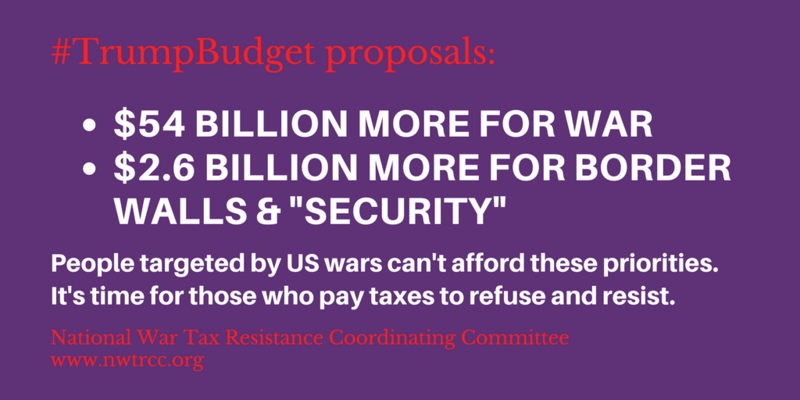 The budget summary tells us these cuts are necessary because the world is more dangerous than ever (hot tip to folks in power: if the world is more dangerous, it’s because of militarism). In addition, the budget allocates $1.6 billion for building just 74 miles of border wall and $1 billion for “high priority tactical infrastructure and border security technology.” Extrapolated with a per-mile cost, that would mean the whole wall would cost over $40 billion, similar to some of the higher estimates from non-governmental sources. US residents are still being asked to buy into this wall, no matter what the cost, and all its associated racism and fearmongering and violence against immigrants. As many have said this year, the prospect of paying for this wall has been enough to propel them into war tax resistance. And this is to say nothing of the enormous arms deals Trump facilitated for American war companies, the effects of which you won’t directly see in this budget document. 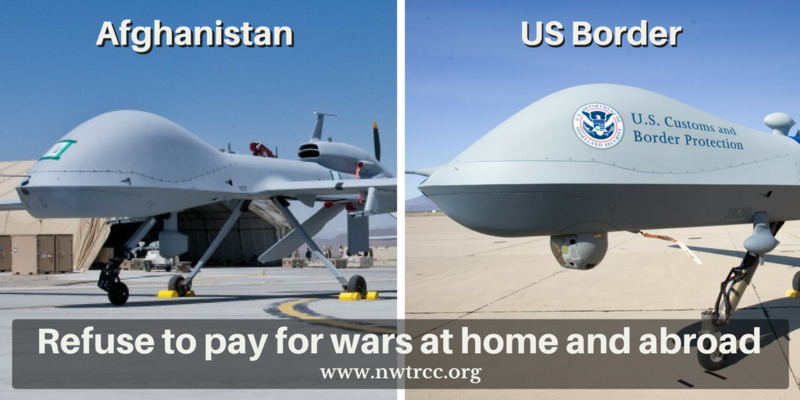 In the face of such gross disregard for the effects of war and militarism, war tax resistance is a practical step we can take, beyond writing to Congress, and alongside the direct actions of civil disobedience in the streets and in the halls of Congress that I hope are upcoming. I know that this government claims to stand for me and my rights. But I don’t feel free and safe when people are killed by US bombs. This government tells me the only way I can be free as an American, as a white American, is through military violence in other countries, and police violence here. I believe in something better than this government’s failed promises to get me to buy into its myths of war, white supremacy, and wealth. I don’t know how to get to that something better, and I don’t trust that anyone really knows the way. I feel like I’m flailing around in this world trying to find some good paths. But I do believe in starting with resistance and visions for a better future.